I noticed that I’ve been in a pie loving mood this past week. It’s probably because my computer broke and I took that opportunity to test out some recipes in the kitchen distraction-free. 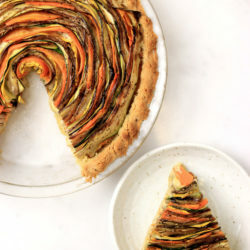 I remember seeing a really beautiful picture of a spiral vegetable tart on either Pinterest or Facebook and wanted to try my hand at it. 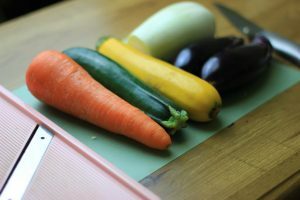 I originally wanted to make this recipe using different coloured carrots, but I could only find orange ones so I decided to use different vegetables instead. 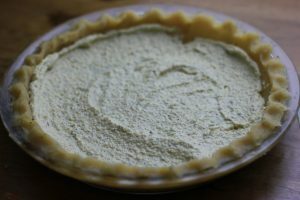 Most spiral tarts have a dairy base below the veggies and so I wanted to try and make this recipe dairy-free and try my hand at a cashew cream. Whenever I make a new recipe, I usually have to play around a couple times with it before uploading it here, but this time it was just perfect! I think my pie was definitely on the “orange” side so I definitely recommend finding different coloured vegetables if you have access to some! I definitely recommend making this recipe because the crunchiness of the vegetables, the cheesy texture of the cashew cream, and the crumbly texture of the gluten-free pie crust were a match made in heaven. At first look, this pie may seem to be quite simple in taste, but it actually packs a lot of flavour! When I first made the cashew cream, I decided to soak them in water first so that they would be easier to blend in the food processor. I wanted them to have a softer texture than usual and have absorbed a bit of water so that my cream could be thinner. I think the trick to making a “cheesy” cashew cream is to add nutritional yeast. If you look up vegan recipes for cheese, they always combine cashew meal and nutritional yeast together to give it that cheesy texture. I really like the fact that you can taste the Dijon flavour inside the cream; I think it really stands out. 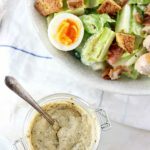 The cashew cream can be eaten as a vegetable dip so if you have any leftovers veggie slices and cream, you could dip them in it! I did that and it was delicious! As for my pie crust, I used the same kind of crust as my Paleo Tourtiere, based on Elana’s pantry’s recipe. 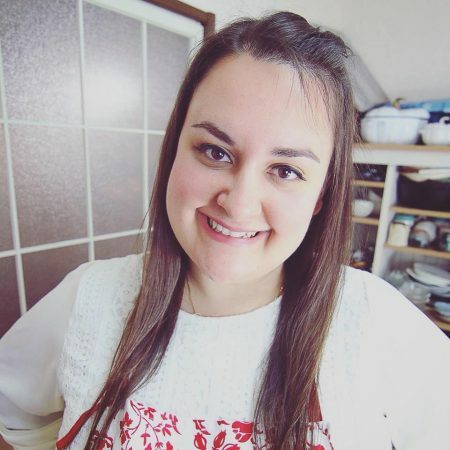 Instead of using coconut oil, like she did, I switched to beef tallow to give it that nice “lard” flavour that I used to enjoy in wheat-based recipes. The crust was actually perfect for the cashew cream. I swear you could simply bake the crust with the cream and serve it as an appetizer as it was just so good! 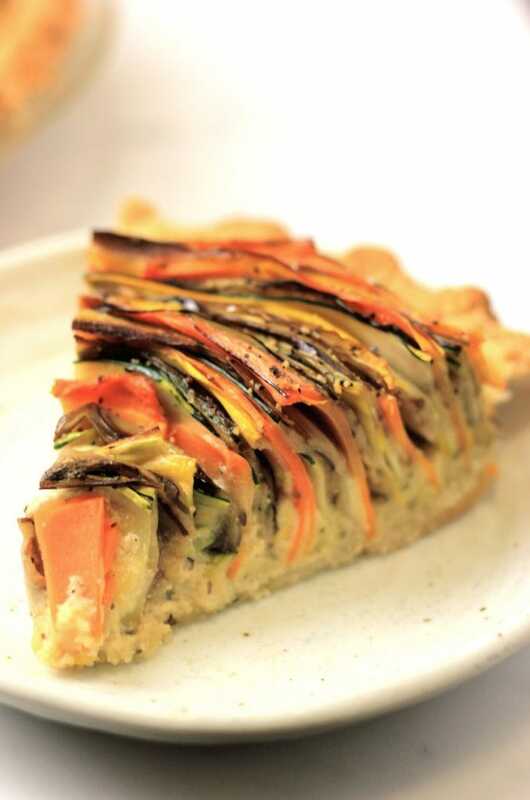 While the pie is cooking, the vegetables sink in the cashew cream and so each bite you take is guaranteed to be smothered in the delectable cream. 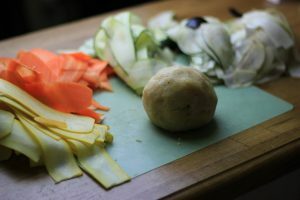 The trick to making the vegetable roulade is to first take one slice of vegetable and roll it up tight. 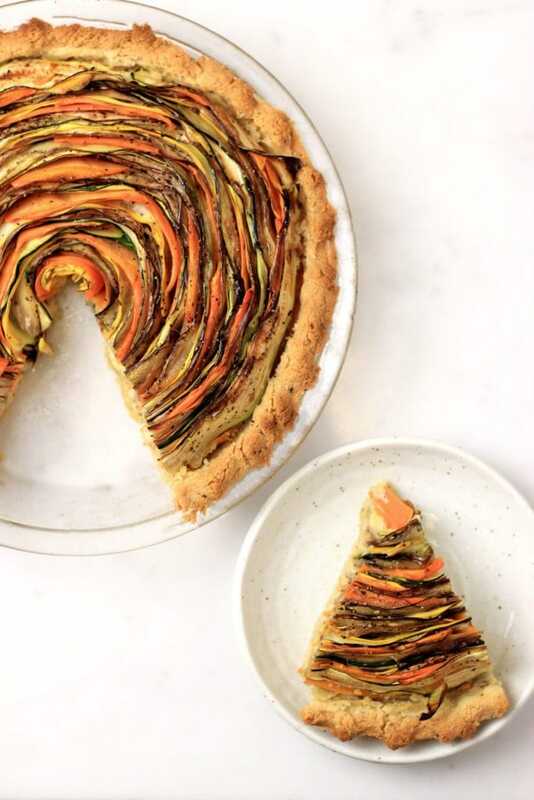 Wrap a couple more vegetable slices around and place it in the middle of the pie. 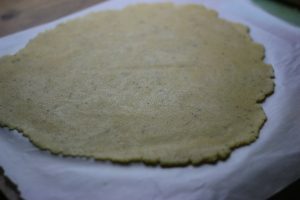 You then continue rolling and wrapping the slices, in a random order, around the main circle until your each the pie crust. The carrots will be the hardest to wrap as they’re not as flexible as the zucchini and eggplant. 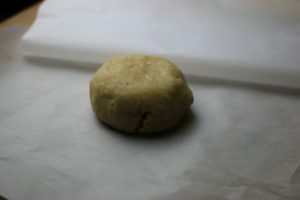 If you don’t remember how to make the dough, I took some pictures of the process just to show you a general idea. 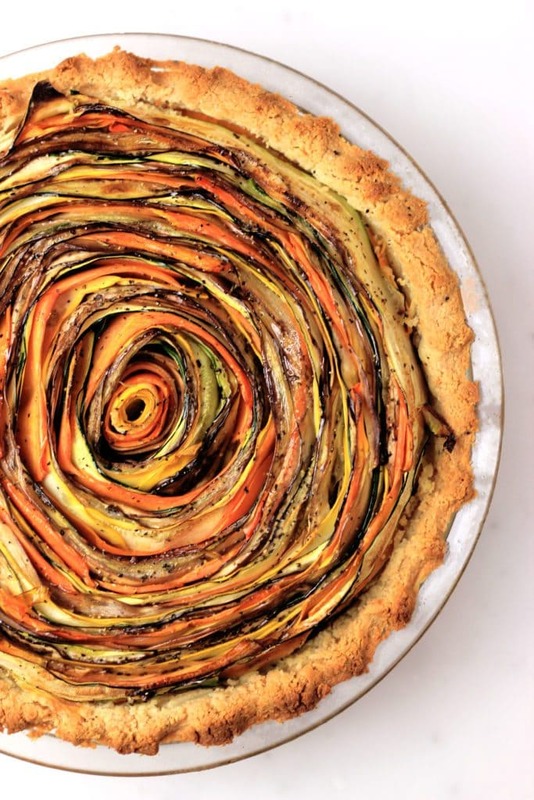 You can also see a picture of the spiral vegetable tart when it’s finally ready to go in the oven! and pulse until a smooth paste forms. 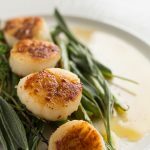 In a large bowl, combine the almond flour, salt, pepper, beef tallow and eggs. Mix together either with your hands or a silicone spatula until the mixture forms into a ball. Separate into 2 since we're making two pies.
. Peel the top parchment paper and carefully flip the dough over the pie plate. 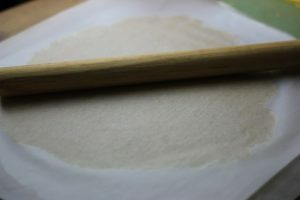 With the paper still on, press the paper right against the pie plate so that the dough sticks to the plate. Carefully peel the paper off and fix any issues you may have. Repeat with the second pie. Spread 1/2 the cashew cream onto the bottom of each pie. , thinly slice all of the vegetables lengthwise. 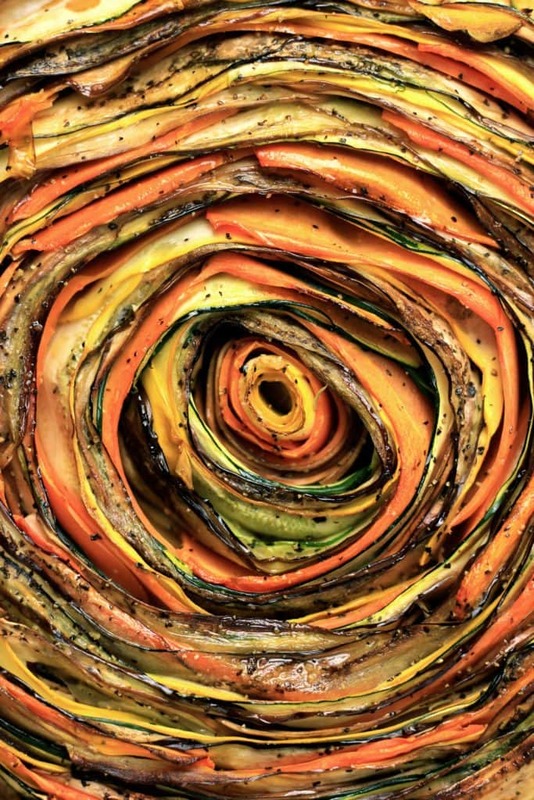 Tightly roll one slice of zucchini into a tight circle and wrap a couple more slices around. 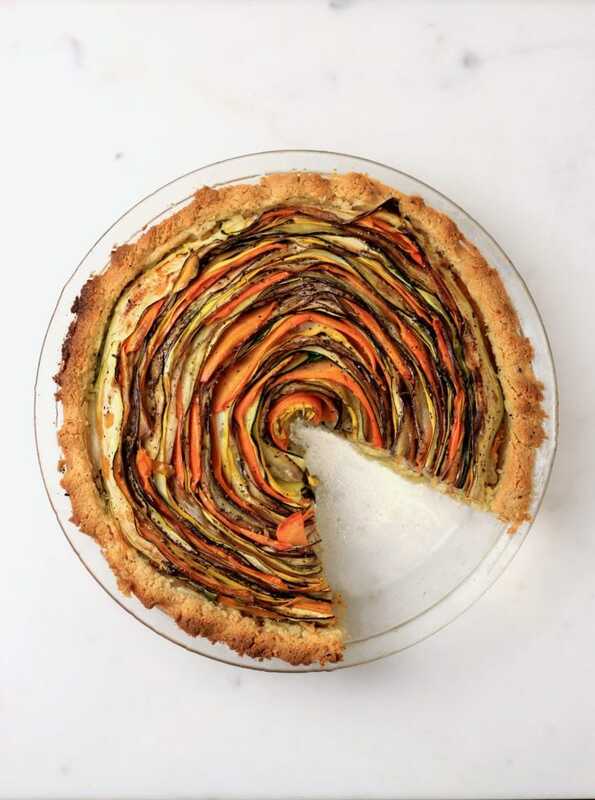 Place it in the middle and start wrapping and rolling random slices of vegetables around the pie until you reach the crust. The carrots will be the hardest to wrap as they're less flexible than the rest of the veggies. Drizzle a tbsp of olive oil and sprinkle with half the salt and pepper over the entire pie. Repeat this process for the 2nd pie. Bake in the oven for 40-45 minutes or until the crust starts to brown. Let cool 10 minutes before slicing. This recipe makes two 9'' pies. 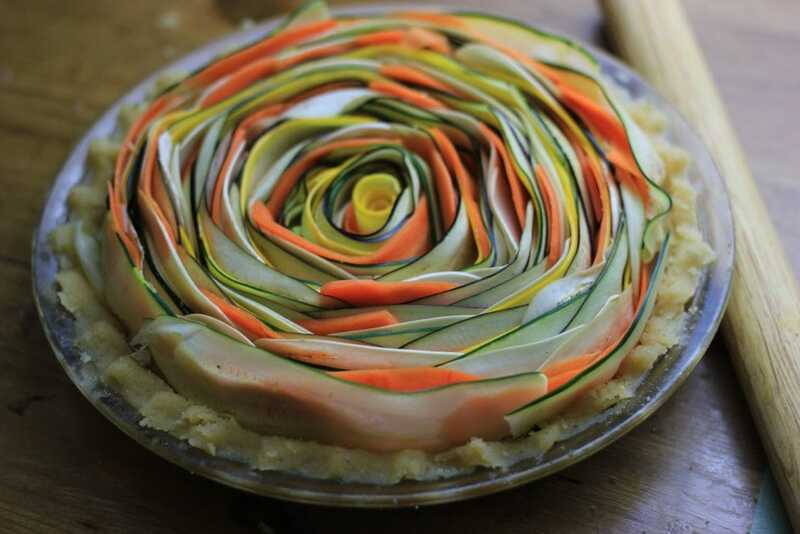 Alternate between different coloured vegetables to get a different coloured pie. Just made the cashew cream for the tart, and it is AMAZING!!! And can be so versatile for other recipes, too! 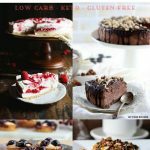 So glad I tried it – Thank you!!! OMG thank you so much. The cashew cream was absolutely amazing!